An informative, educational blog to help support writing with Mr. Miller at BHS. There are numerous places to go for assistance on writing a college application essay. 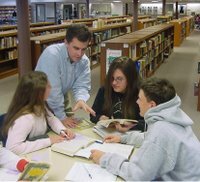 Dozens of websites, publications, and books are devoted to helping students with their essays. There is no one simple equation for an effective essay, but, like the student writing them, each is unique. Often, these books, publications, and websites do publish examples of college application essays. Reading other essays is a great way to get a sense of the broad variety of writing out there. You should read what others have written. Use these essays to stimulate your own imagination for what you want to write. Remember, each essay should be deeply personal and original. There's nothing wrong with getting ideas from what others write, but your essay should be a reflection of you, and only you. To help you get a better sense of what colleges are looking for, here is a couple of pages from a Newsweek publication about what makes an essay good. Not every page is available free online, but pages 3 to 6 contain some helpful information. Another resource is the book 100 Successful College Application Essays and there are some good excerpts published here. Last year, a Colorado high school set up a group page for all its seniors to post and share their college essays. The purpose was to encourage collaboration and peer-to-peer feedback. It's an interesting idea and you can see all their essays here. Not all may be final drafts, but you can read what other high school students are writing about. The publication Teen Ink also carries numerous college application essays. They publish a monthly literary magazine aimed at high school writing classes. Their website has a section of popular application essays. Their site also contains other, helpful information about colleges, all written by teens. Hope these resources help you as you begin writing your essay. Remember, we need a workable draft for class on Thursday. Good luck. Welcome to a week-long course designed to help students write a successful college essay. This site will serve as a companion resource for the class, which is sponsored by the Branford High School PTA. During the week of the class, this blog site will serve as a resource, providing updates about the schedule and offering helpful links to help students write their college essay. At the conclusion of the class, this site will continue to serve as a broader writing resource for high school students at Branford High School. Writing an effective, memorable essay is a significant component of the college application process. This course is designed to help students with that process, and is focused on preparing and writing a college application essay. As part of the course, students will read sample college essays, complete exercises to help them develop ideas for their essays, compose the first drafts of an application essay, peer-edit one another's essays, and meet with a teacher to discuss their writing. In all, the activities and lessons will assist students in drafting and revising their essays in preparation for submitting them as part of a college application. Take a look again at #6 - "Topic of your choice." Even though the folks at the common application have developed five standard prompts, there is still room for you to write something outside of them. So there it is. Writing a college application essay is wide open. Don't look for simple answers about what to do, but rather use the experience to write a powerful, personal, and original essay. Feel free to leave any comments or questions for me. Good luck. Throughout the semester, we've completed a variety of assignments in this class, from essays structured in exact ways, to more personal and opinionated pieces. One part of the class involved using a blog - first this one and then your own personal blogs - as a way to share ideas, respond to ideas, and publish our work. I hope, too, it helped you learn in a more personal way. As you completed your final research essay, the blogs played a larger role than in any other assignment. I required that you keep track of some of your research and post regular reflections and ideas about what you had found. I asked that you hyperlink to your sources as a way to cite and acknowledge where your ideas came from. Then, when you got closer to the end of your research, I asked that you post parts of your essay on the blog, too. At all stages, I was able to post comments on your ideas and thinking. Your classmates were also able to share your ideas and leave their own comments. What was the most valuable part of the blogging process? How did using a blog help or not help you learn in class this semester? What is it you're most proud of that you have written on your blog this year? (Be sure to include the hyperlink to your post) What might you suggest to use blogs like this more effectively in a learning environment? How a writer grabs a reader's attention can be the most important part of a piece of writing. After all, if the reader is bored after the first few sentences, what good is any of the rest of the essay? To catch a reader's attention, your introduction needs a compelling hook, as outlined in this excellent resource site from John Jay College. How do you plan to start your essay? What will you do to grab the reader's attention? 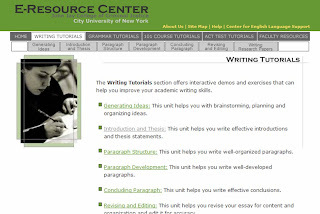 Select one of the styles of hooks from the John Jay writing tutorial site and write a rough draft of your introduction. Before you write, you should review these excellent exercises from John Jay to help you. Once you have it written, test drive your introduction on the blog. Here's how I'd like you to do it. First, review the site on introductions and write your introduction on your blog. Next, underneath your introduction, write a few sentences that briefly explain why you chose to start your essay the way you did. Finally, ask a question you'd like answered about your introduction. It should be a question about your writing, not the content of your essay. For example, you might ask the readers whether the question you started with works or not. Ask a specific, focused question that invites concrete feedback. Once you've done that, go read your classmates' introductions and give them some feedback. We're getting down to the end of the semester, and you should be proceeding along with your final essay. At this point, I've enjoyed keeping track of your blogs and postings as you conduct your research and begin your writing. The final essay will be due Monday, Jan. 14 at the beginning of class. Remember, it's your final essay so don't procrastinate or make a solid effort to write it well. As of right now, many of you have some ideas about a topic for the final paper, but I'm noticing that your topics are quite broad. In many cases, too broad that I think it will be difficult for you to write a focused essay to meet the requirements of the assignment. Remember, this is not a research paper like you did in 9th grade. You decide the topic, the purpose, and the audience. As we have talked about all year, one of the most crucial aspects of the writing process is developing an idea for writing. Put some time and effort into that, and the writing part will come much easier. This is a large writing project and one in which you cannot afford to waste too much time researching unnecessarily. Your next assignment, then, will be to start to narrow the focus of your essay. Use your blogs to write/reflect on the following prompts in a blog due by Tuesday. Why does this topic need to be written about? What type of audience will be reading your essay? Why would they read it? In other words, what new and interesting angle are you bringing to the topic? Where will you get your information? Note to students: what follows is a sample blog entry I wrote as if I was assigned the same prompt you have been assigned. I attempted to answer the same questions asked of you and respond in a way you have been asked to respond. 390 words by the way. Imagine that! As I thought about a topic to investigate, many ideas crossed my mind. I'm interested in the emerging web 2.0 technology that allows such rich interaction and collaboration via the internet. As I was skimming through some blog posts about using new technology, I found a blog called Students 2.0, which is run by student bloggers, for other students. Sounded kind of interesting. There was this posting on it called Plagiarism: Not Quite As Simple As It Seems by a student from New York. In her posting, she discusses the different challenges that both students and teachers encounter in terms of plagiarism. What struck me is that some of the questions she raised about plagiarism and how to define it are just as difficult for students as they are for teachers. And in many cases, the definition is just plain murky. The student writes about how she finds herself "staring at the computer screen, unsure on whether I can copy my AP Environmental Science textbook’s definition of biodiversity or if I needed to paraphrase. Do I even know how to paraphrase that term when the textbook’s definition seems to leave no room for a more direct explanation? 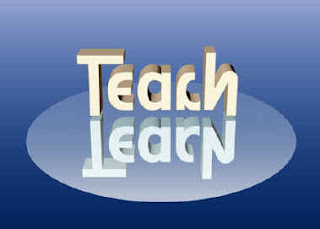 Teachers always tell students to reword things they write, but what if the student can’t think of another way to reword what they want to say? In this incidence, sheer laziness isn’t the factor behind it." She goes on to say that copying word for word is inexcusable - as all students should know - and that both teachers and students should know that "technology works both ways." Teachers can use online plagiarism software or even just Google as easy as kids can cut and paste from the internet. I know I have regularly used Turnitin.com to detect plagiarism. With so much information available, what exactly is the best way to deal with it? Anyway, her ideas got me thinking about the topic, and I think I'd like to write my paper on plagiarism. How has the internet altered the way plagiarism is detected? What are current plagiarism policies at colleges and what other issues have arisen with the new technology? I thought I had heard about a student suing a school over using Turnitin.com, so maybe there are some court cases or other information I could pursue. This blog is designed for Mr. Miller's writing classes @ BHS. Here you will find regular information, assignments, and writing prompts related to our classwork. Additionally, just below here you will see some links and other resources you might find useful. It is also important to note that all work you complete on this page must adhere to the Branford Public School's acceptable use policy for computer use. For more specific information about an English class, visit the English department's website.